Fidelity National Financial Inc (NYSE:FNF) has experienced a decrease in support from the world’s most elite money managers of late. Our calculations also showed that FNF isn’t among the 30 most popular stocks among hedge funds. Let’s take a glance at the key hedge fund action surrounding Fidelity National Financial Inc (NYSE:FNF). How are hedge funds trading Fidelity National Financial Inc (NYSE:FNF)? At the end of the fourth quarter, a total of 28 of the hedge funds tracked by Insider Monkey were bullish on this stock, a change of -3% from the previous quarter. 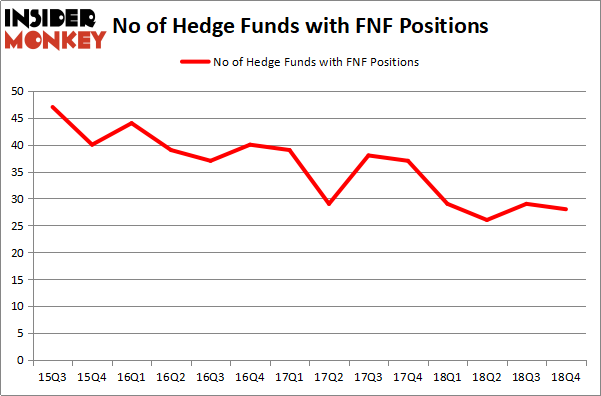 The graph below displays the number of hedge funds with bullish position in FNF over the last 14 quarters. With hedge funds’ capital changing hands, there exists an “upper tier” of noteworthy hedge fund managers who were boosting their stakes considerably (or already accumulated large positions). When looking at the institutional investors followed by Insider Monkey, Cliff Asness’s AQR Capital Management has the biggest position in Fidelity National Financial Inc (NYSE:FNF), worth close to $137.1 million, accounting for 0.2% of its total 13F portfolio. The second most bullish fund manager is Paul Marshall and Ian Wace of Marshall Wace LLP, with a $74.5 million position; 0.8% of its 13F portfolio is allocated to the company. Other members of the smart money that hold long positions encompass D. E. Shaw’s D E Shaw, Jim Simons’s Renaissance Technologies and Martin Whitman’s Third Avenue Management. 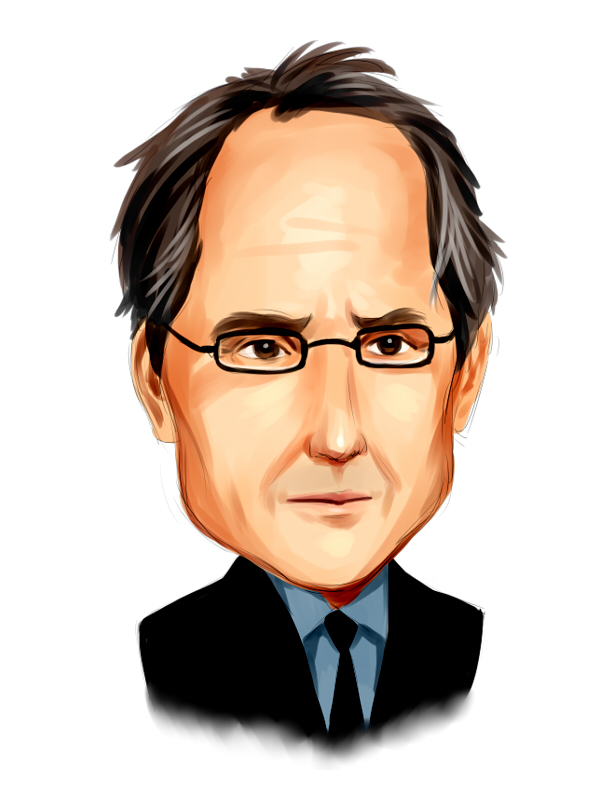 Because Fidelity National Financial Inc (NYSE:FNF) has witnessed declining sentiment from the entirety of the hedge funds we track, it’s easy to see that there were a few hedge funds that slashed their entire stakes last quarter. At the top of the heap, Matthew Hulsizer’s PEAK6 Capital Management dropped the largest position of all the hedgies monitored by Insider Monkey, valued at close to $1.1 million in stock. Michael Platt and William Reeves’s fund, BlueCrest Capital Mgmt., also sold off its stock, about $0.5 million worth. These moves are important to note, as total hedge fund interest dropped by 1 funds last quarter. Let’s check out hedge fund activity in other stocks – not necessarily in the same industry as Fidelity National Financial Inc (NYSE:FNF) but similarly valued. These stocks are Cenovus Energy Inc (NYSE:CVE), Melco Resorts & Entertainment Limited (NASDAQ:MLCO), Herbalife Nutrition Ltd. (NYSE:HLF), and Centrais Elétricas Brasileiras S.A. – Eletrobras (NYSE:EBR). This group of stocks’ market values are similar to FNF’s market value. As you can see these stocks had an average of 18.75 hedge funds with bullish positions and the average amount invested in these stocks was $1184 million. That figure was $380 million in FNF’s case. Herbalife Nutrition Ltd. (NYSE:HLF) is the most popular stock in this table. On the other hand Centrais Elétricas Brasileiras S.A. – Eletrobras (NYSE:EBR) is the least popular one with only 5 bullish hedge fund positions. Fidelity National Financial Inc (NYSE:FNF) is not the most popular stock in this group but hedge fund interest is still above average. This is a slightly positive signal but we’d rather spend our time researching stocks that hedge funds are piling on. Our calculations showed that top 15 most popular stocks among hedge funds returned 21.3% through April 8th and outperformed the S&P 500 ETF (SPY) by more than 5 percentage points. Hedge funds were also right about betting on FNF as the stock returned 22.6% and outperformed the market as well. You can see the entire list of these shrewd hedge funds here.